Bono’s airplane lost a rear hatch while flying from Dublin to Berlin, so feel free to holler if you find it. CNN’s Katia Hetter and Lindsay Isaac offered more on the story, stating that the lost hatch was part of the rear portion of the plane and that two pieces of luggage are now missing. Bono was set to join his band mates in Gemany for Thursday’s Bambi awards, where the iconic group will perform. We don’t believe the incident will put that much in danger as CNN points to this image that illustrates all was business as usual for Bono after landing. According to the report, the plane landed at 12:26 a.m. local time, and that is when officials noticed that the luggage compartment door was missing. So far officials are amiss as to what occurred, although the working theory seems to be it was incorrectly closed and secured. The official also mentioned, “This sort of thing is not common,” so don’t expect any hatch-door showers anytime soon. As Marsh mentions, the rear compartment is completely separate from the main cabin, so there was no danger of ever losing pressure. 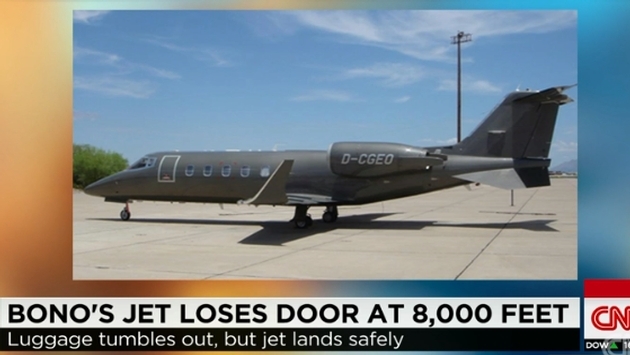 What is left is the knowledge that the rich and famous lose luggage too—only it happens when they lose a door on their private jet.